Is there a free DVD to iPod converter? When you want to get some music videos from some DVDs, you might eager to know a free version to extract music or video from DVD to iPod compatible formats. The article lists 4 frequently used free DVD to iPod converters together with their excellent features. But what should you do if the free version does not work? Especially when you are using some commercial DVDs or need to edit the files? You can also find the ultimate DVD to iPod converter to get the desired result according to your requirements. When you are looking for some DVD to iPod converter totally free, here are the 4 most frequently used programs. Of course, you can also find some freeware with lots of limitations, which is not recommended in the part. 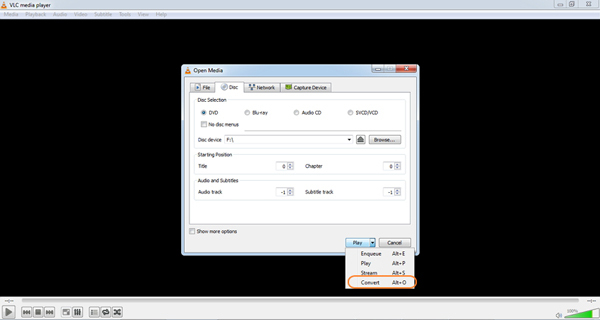 VLC Media Player is a versatile and open source DVD to iPod converter. It enables you convert DVD to MP4 or MP3 formats. But if you need to convert some commercial DVDs, or the desired type of iPod format directly, it should not be a nice solution. 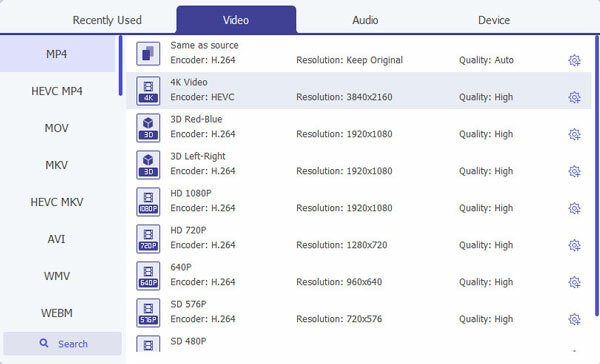 Different video codec and audio codec to choose for converting DVD. Fine-tune the music files with equalizer, compressor and specializers tabs. Provide few the optimal presets for iPod or other devices directly. Do not work with some commercial DVDs with DRM protection. There are limited customization settings to adjust the output files. Complicated and time consuming to convert DVD to iPod formats. Handbrake is open source transcoder to rip DVD into iPod compatible formats. It is easy to convert homemade DVD to iPod with the program. But if you need to convert the commercial one, you have to install some plugin for the DVD to iPod converter instead. Alter the bitrate, maximum file size and other transcoding solutions. Batch encoding under the help of interface with graphic user/command line. The old user interface and complicated process for beginners. Install the libdvdcss plugin in order to convert commercial DVDs. Lack of video editing features or other DVD menu features. Limited presets for a few pack of iPhone, iPad and iPod only. DVDshrink was an excellent DVD to iPod converter with excellent features. But it only works well with Windows 7 or Windows XP. It should be a straightforward program to convert or backup DVD if you still using the old operation systems of Windows. Fast ripping speed to backup or convert DVDs to the desired video format. Remove the popular DVD copy protections, such as CSS, RC, REC, etc. Cannot burn DVD backup copies directly without Nero burning software. The DVD to iPod converter has been stopped updating since 2005. There are bugs and issues for converting DVD with Windows 8/8.1/10. Cannot burn and rip DVD while decrypting new DVD copy protections. Just as the name of MakeMKV, you can use the DVD ripper to rip DVD to MKV only. Of course, you can find some online video converters to convert DVD to iPod compatible formats. You can convert homemade DVD, commercial DVD and even Blu-ray discs with the program. Compress DVDs to H.264 with multiple audio and subtitle tracks. Support both commercial DVDs without extra plugins. Convert DVD to MKV file only, does not support MP4, MP3 or others. 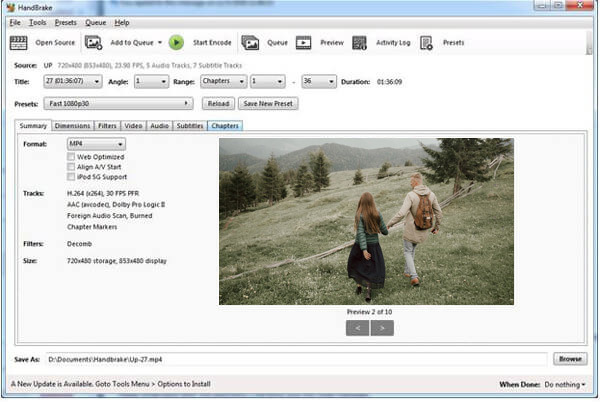 Limited editing features to further edit the movies from DVD disc. Do not work well with DVDs with a large size or multiple threads. Need to choose the right title you need to convert manually. What is the best free DVD to iPod converter alternative? 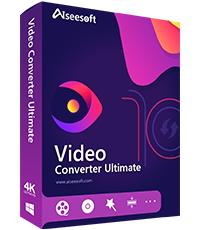 If you need to convert some precious music videos on DVD to iPod or other formats, Aiseesoft Video Converter Ultimate is just the one you have to take into consideration. It is able to convert homemade DVDs and commercial ones to iPod directly. Moreover, you can also find multiple editing features, or even the enhancing features for the DVD to iPod converter. Convert DVDs to iPod for both homemade DVDs and commercial ones. Add external subtitles, audio tracks and more others to the output. More than 300 videos, audios and presets, including iPod series. Multiple editing effects and features to get the best output videos. Enhance the video quality and de-shake the original DVD videos. Once you download and install the DVD to iPod converter on your computer, you can insert the DVD into the DVD slot of your computer. After that click the “Load DVD” button to load the DVD into the program. It will automatically recognize the videos from the DVD, even for the commercial ones. After that click the “Profile” menu to choose the output format. You can find the presets for different iPod types. Moreover, if you have a special requirement for the output, such as FLAC for the music files, you can find the option without problem. Adjust the “Settings” to get the best output format with bitrate, frame, volume and more. For some DVDs was released years ago, which should be blurred or even with shaky videos. If you want to get a great result for converting DVD disc to iPod. 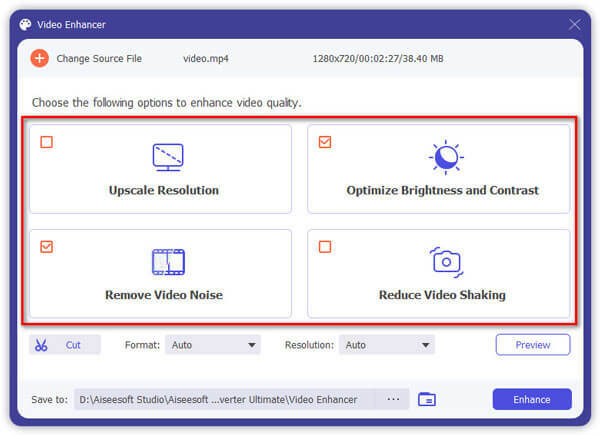 Click the “Enhance” option, you can upscale the video resolution, optimize video brightness and contrast, or even reduce video shaking within one click. Of course, you can also use the other editing features, or apply some special effects for the output movies. Once you get everything done, you can click the “Convert” button to extract the best videos and audios from the DVD. It takes a period of time to convert the DVD to iPod for your device. After that you can use iTunes on Mac to transfer the files from computer to iPod. There is a DVD to iPod suite for Mac to convert and transfer files to iPod directly. If you are looking for a free DVD to iPod converter, the article provides most of the totally free DVD rippers without restrictions. But the process should be complicated when you need to turn DVD movies, especially the commercial DVDs to iPod directly. When you convert or rip with more than one programs, it should be a great damage to the quality of the output videos. Aiseesoft Video Converter Ultimate should be the all-in-one DVD to iPod converter to convert DVD with the best video quality for iPod, or even add subtitles or audio tracks to DVD output. More queries about DVD to iPod converter, you can share more detailed information in the comments.